Lets firstly look at what PEP means in the real world. Peak Envelope Power ‘pX’ (s1.157) means the average power supplied to the antenna transmission line by a transmitter during one radiofrequency cycle at the crest of the modulation envelope taken under normal operating conditions. 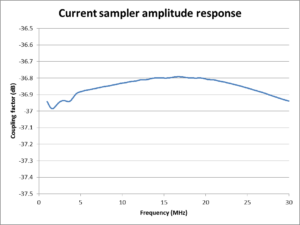 Mean Power ‘pY’ (s1.158) means the average power supplied to the antenna transmission line by a transmitter during an interval of time sufficiently long compared with the lowest frequency encountered in the modulation taken under normal operating conditions. Carrier Power ‘pZ’ (s1.159) means the average power supplied to the antenna transmission line by a transmitter during one radio frequency cycle taken under the condition of no modulation. Note: For use in formulae, the symbol p denotes power expressed in watts and the symbol P denotes power expressed in decibels relative to a reference level. So, taking the meaning of PEP, the average power in one cycle of a RF cycle which is almost a pure sine wave is simply Vrms^2/R or Irms^2*R. Since Vrms of a sine wave is Vp/2^0.5 and Vpp/(2*2^0.5) we can write PEP=(Vpp/(2*2^0.5))^2/R=Vpp^2/(8R). The last expression is most convenient when using an oscilloscope where measurements are scaled from the graticule. An oscilloscope can be used to measure the signal voltage across a known load, and so calculated the PEP. There are lots of traps in making accurate voltage measurements at RF, the high impedance scope probe for several reasons, and more so if it is a dividing probe which addresses some problems of the 1:1 probe but introduces significant calibration uncertainty at RF. A sampler is a device designed to insert in the line from transmitter to load, and that obtains a sample of the signal without disrupting the connection from transmitter to load. Samplers vary in technique, quality and effectiveness. For this article we will use a sampler that samples transmission line current and couples that to the sampler port for measurement on a scope. Above is a view of the internals of the sampler. It is a shielded current transformer with an internal low R load, and calibrated for connection of a 50Ω instrument to the sampler port (the BNC jack). 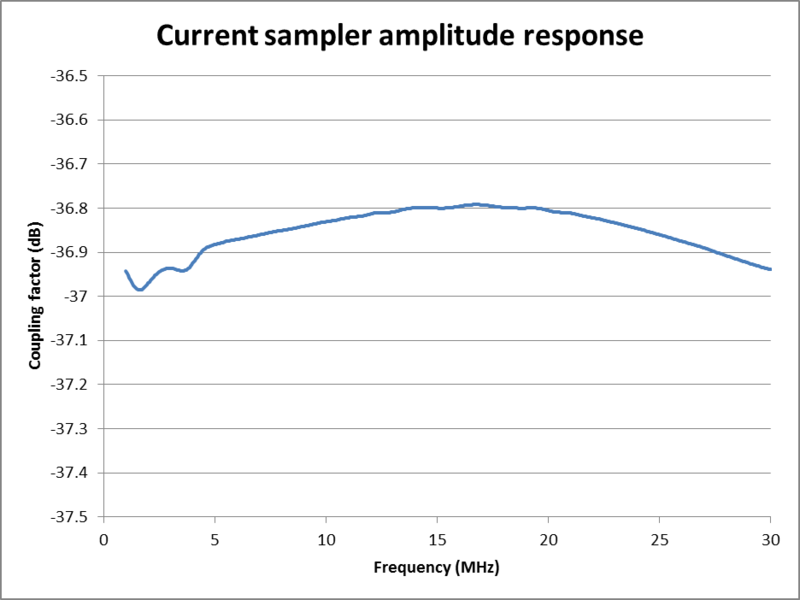 We will take the sampler calibration from this calibration curve to be -36.87dB at 7.1MHz, 1/4,864 as a simple ratio. Above is a screen capture of spoken voice with the transmitter connected via the sampler to a 50Ω load. 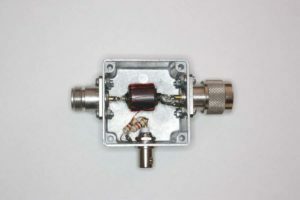 The sample port is connected with a short 50Ω coaxial cable to the scope input which has an inline 50Ω termination at the input socket. This is important as it means there is insignificant reflection on the sampler to scope cable, there is negligible standing wave and the voltage out is approximately equal to the voltage in. 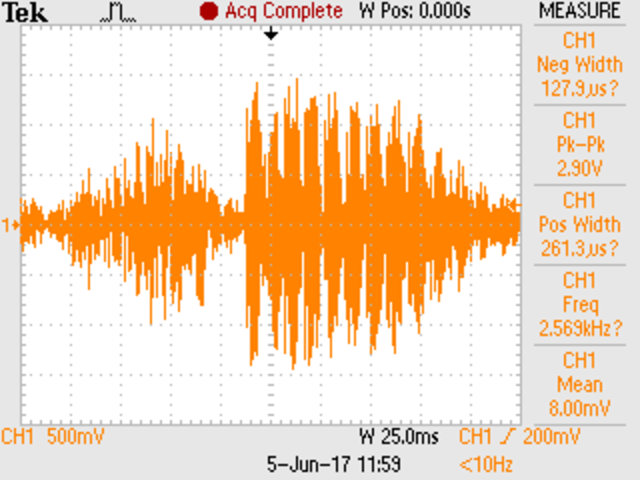 Relying upon the sampling scope to capture the waveform, Vpp is 2.90V. 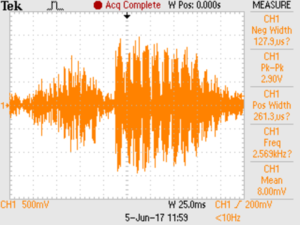 One of the advantages of the DSO is the ability to make such measurements but with this waveform, you must not rely upon the rms value if available… it is not the rms value for just one cycle at the crest of the modulation waveform as required. Peak Envelope Power at the sampler output is Vpp^2/(8*R)=2.90^2/(4*50)=21.03mW. Dividing by the sampler ratio gives 102W. There is considerable uncertainty in such a measurement, and it is likely to be no better than about 5% 0.2dB. Easy, isn’t it. A DSO with suitable calibrated sampler can be used quite effectively to measure SSB telephony PEP, the waveform can be captured in storage and measured using the graticule or the inbuilt cursors and measurement functions. That said, it must be realised that a DSO is not continuously monitoring the signal, there is a missed period between traces and if used in a manual mode as was done here, only a small fraction of overall time is captured. A conventional (ie non-storage) has been used effectively to measure PEP of periodic waveforms, but it is quite challenged by speech, so it turns out to not be a good instrument to measure SSB telephony. Even with brightness turned to max and viewed in a darkened room, very short peaks on the display may not be seen, much less reliably scaled off the graticule. holds that response long enough to read the display device. A common circuit is a simple half wave detector with enhanced charge and decay times. To be effective for PEP measurement of SSB telephony, it needs to charge the accumulator capacitor in 30ms or so of RF burst, and have a decay time of some seconds so that the meter can be read. Good implementations require an active circuit, it they require power to operate. Poor implementations are usually marked by longer charge times, and some ham grade instruments with a PEP switch are so poor as to be unusable for PEP measurement on SSB telephony. Circuits that do not require power are unlikely to work well at all. The advantage of this type of instrument is that it is active all the time, and captures significant bursts of RF, often more effectively than a CRO, and the output can be used to activate an alarm if desired. A properly working implementation is very effective in monitoring PEP output of an SSB transmitter under speech modulation. Oh, the oft cited wisdom listed at the start… they are all wrong.